Reflection for the Sunday Readings. Today, as the Church celebrates the third and final Scrutiny for the Elect of God, the readings prepare us for the death and resurrection of our Lord. The elect, along with the candidates, are on their final two weeks of their journey through the desert. They are parched with thirst as they long for baptism and they hunger for the Eucharist. 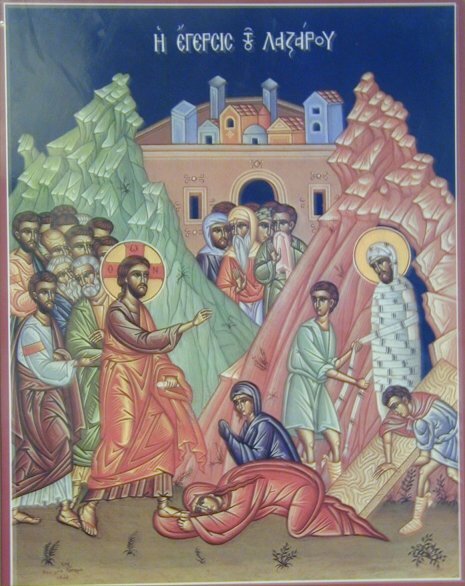 Like Lazarus in today’s Gospel, they will emerge from their tomb of sin as they rise up from the waters of baptism. The first reading concludes Ezekiel’s vision of the dry bones where the dead are gradually restored to life. Ezekiel’s prophesy gives hope to the Jews in exile, the dry bones, that God will restore the nation of Israel. God will open up their graves; they will rise from them. Only God can give new life to the dead. The psalm is a prayer of hope. God is a God of endless mercy and forgiveness. God waits to restore us and redeems us from the death of sin. God’s people are never without hope. St. Paul reminds us, in the second reading that in baptism we are resurrected with Christ. In Baptism we are restored to life just as God’s breath restored life to the dry bones. Through baptism the “Spirit of God” dwells within us. He call us from our tombs and makes us a new creation. The vision of Ezekiel and the resurrection of Lazarus in today’s Gospel are closely linked. Resurrection, to the ancient Jews, was a sign of the coming of the Messiah when God would gather in all of the Jews from every nation and resurrect the kingdom of Israel. The resurrection of Lazarus pre figures the resurrection of Christ. It is a Gospel rich in symbolism. John tells us that Mary is the one who anointed Jesus with oil. This anointing was in preparation for his death. A close reading of the Gospel text reveals a strange detail. When Jesus was given the message that the friend that he loved is gravely ill in another town, he does not hurry to go and see Lazarus. Instead we are told that Jesus stayed where he was for two more days! Jesus waits until his friend dies to go to him, so that he can provide a sign for the disciples. But Jesus is not just showing how powerful He is. He wants his disciples to see that He can raise the dead, so that they will believe when He himself rises from the dead. John tells us that before Jesus goes to the tomb of his friend he wept. Jesus weeps not just for Lazarus. He weeps for all of us, because human sin has brought suffering and death into the world. Lazarus represents all of humanity. When Jesus weeps He shows his humanity and he demonstrates his solidarity with the human race. The resurrection of Lazarus shows us the great mercy of God. God is always waiting to redeem us, reconcile us, and restore us to a new life in Christ. He waited for Lazarus to die, staying in the same place until he could tell his disciples that he was dead; then he announced his intention of going to him. Lazarus is dead, he said, and I am glad. Was this a sign of his love for his friend? Not so. Christ was glad because their sorrow over the death of Lazarus was soon to be changed into joy at his restoration to life. I am glad for your sake, he said. Why for their sake? Because the death and raising of Lazarus were a perfect prefiguration of the death and resurrection of the Lord himself. What the Lord was soon to achieve in himself had already been achieved in his servant. This explains why he said to them: I am glad for your sake not to have been there, because now you will believe. It was necessary that Lazarus should die, so that the faith of the disciples might also rise with him from the dead. This entry was posted in Catholic and tagged 5th Sunday in Lent, Catholic scripture, Sunday Reflection. Bookmark the permalink.